Come summertime at Mark Takagi's house, you’ll find sangría. And lots of it. Traditional red sangría is more popular than the white version, he says, but the white nectar is gaining in popularity. That’s especially true now, at the height of peach season—celebrated at Metropolitan Market (metropolitan-market.com) with Peach-O-Rama, a month of in-store events, tastings and celebrations of all things peachy. With their natural sugar content, peaches pair perfectly with Takagi’s go-to white wine for sangría: Riesling. Riesling also is made in a variety of styles, which means there’s something for everyone. Takagi doesn’t like sweet sangría, so he leans toward dry and off-dry Rieslings that contain less than 2 percent residual sugar. If you like it sweeter, look for a higher sugar content. Luckily, we make world-class Riesling in Washington state, with many great choices at reasonable prices. » Combine ingredients in a pitcher and refrigerate for 2 hours. 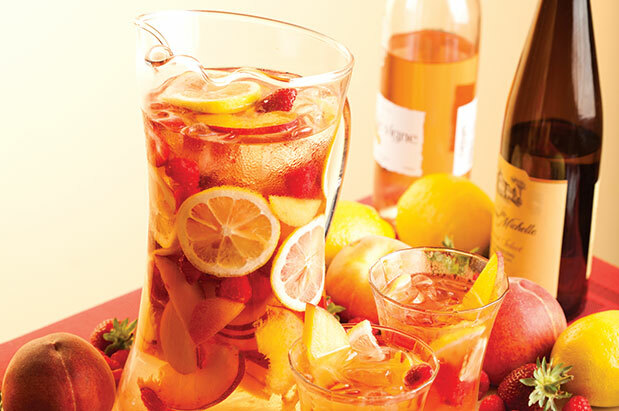 » Serve with ice in tumblers or wine glasses. Charles Smith 2014 Kung Fu Girl Riesling, Ancient Lakes, $13 (1.5 percent residual sugar): White peach, lime and apricot notes give way to a long mineral finish. For a savory white sangría recipe with peaches, ginger and lime—and more recommended Rieslings for making sangría, go here.